This natural and untreated Colombian Green Obsidian Mini Radiant Heart Pendant is crowned with a stunning teardrop shaped Morganite Pink gemstone. 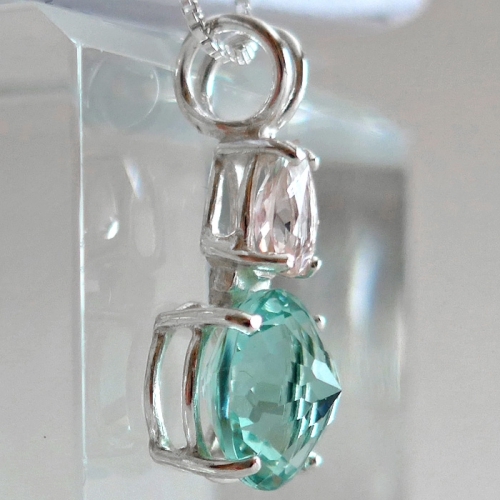 It is set in a simple sterling silver basket setting so that the stones can breathe and it sits flat upon the chest. It comes with an 18" sterling silver chain so it will hang between the throat and the heart so it will assist you in speaking from the heart and comes to you packaged in a lovely velveteen jewelry box. This is one of my favorite pieces in this new obsidian material. It imparts a deeply and gently soothing energy stream enabling one to more easily 'go with the flow'. The combination of Colombian Green Obsidian and Morganite is very powerful energetically, energizing the heart and crown chakras, increasing the flow of prana throughout the system, and strengthening the bridge between the egoistic mind, the heart and Higher Consciousness. If you work in the healing arts, the combination of Colombian Green Obsidian and Danburite can help you to articulate your most creative ideas through the compassionate heart in a way that can be easily understood. On a spiritual level, the combination of Green Obsidian and Morganite connects the heart with the spiritual center, and enables us to speak our own truth simply and directly in such a way that it will definitely be understood by others. Colombian Green Obsidian ranges in color from a beautiful rich grassy green coloration to a luminous pale sea green color with some of the stones also displaying obsidian bubbles created under the pressure at which obsidian forms. According to the creator of this piece, Colombian Obsidian is "natural obsidian formed in the last 2 million years from the Nevado del Ruiz volcano in Columbia. This lush obsidian connects heart and throat chakras releasing stress, providing clarity and serenity. Stimulates creativitiy and abundance." Morganite is a form of beryl, or beryllium aluminum silicate, composed of hexagonal crystals, which can reach gigantic sizes of up to 9 meters long, weighing several tons. 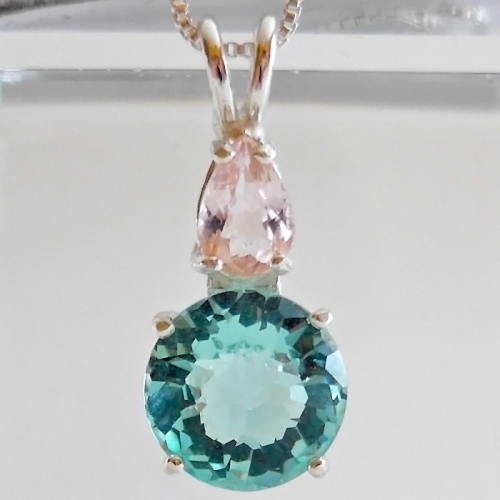 Beryl occurs most frequently as grayish-white, yellowish-white or pale blue-green crystals, but there are several gemstone varieties of beryl, including emerald (green), aquamarine (blue) and morganite (rose). Morganite has an affinity with the heart chakra, which is often associated with the color pink or rose in New Age systems of thought. Crystal healers use morganite to vivify, strengthen, and open the heart chakra. Morganite is said to help develop loving relationships, to strengthen existing love relationships, and to help the bearer understand and manifest balanced relationships between loved ones, between the sexes, and between the races. Morganite has been used for millennia as an aid to social interactions by communities of indigenous peoples around the world, because this magical stone promotes the experience of brotherhood and sisterhood among those involved in group activities. When used in a group setting, morganite facilitates heart-felt speech and heart-felt listening by all parties. Morganite is also a crystal containing the energetic records of past civilizations, and is suitable for use as a "story stone" by intuitives and clairvoyants who can tune into the energetic recordings contained within the crystal, which were captured during the many, many millennia of the crystal's growth cycle. Note: Weight above is shipping weight. Actual weight of this pendant is 4.118 grams.